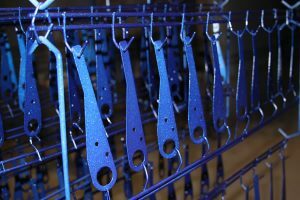 Powder coating is a type of dry coating, which is applied as a free-flowing, dry powder. The main difference between a conventional liquid paint and a powder coating is that the powder coating does not require a solvent to keep the binder and filler parts in a liquid suspension form. The coating is typically applied electrostatically and is then cured under heat to allow it to flow and form a “skin.” It is usually used to create a hard finish that is tougher than conventional paint. Powder coated surfaces are more resistant to chipping, scratching and wearing than other finishes. Powder coating is mainly used for coating of metals, such as “white goods”, architectural aluminium extrusions, automobile, truck and motorcycle parts. Dura Industries has certifications for PACCAR CMT0030 AND CMT0048 and they are approved applicators of PVDF Kynar 500™ powder coatings. They have a conveyorized system to handle large volume jobs and a batch booth for the day to day small jobs. Advantages and disadvantages of powder coating. A significant disadvantage is touching up small damaged places. In many cases the parts have to be re-coated. Virtually unlimited color selection with high and low gloss, metallic and clear finishes available. Texture selections range from smooth surfaces to wrinkled or a matte finish, and rough textures designed for hiding surface imperfections. The pretreatment tanks are checked daily and maintained regularly to assure that the solutions and temperatures are at optimum conditions. In 2006 Dura Industries installed equipment to evaporate wastewater that, for many years, was being discharged into the local sewage system. Today all waste water is evaporated and the volume of water usage has dropped to less than 1/4 of previous usage. Hazardous waste that is hauled to designated landfills has also dropped by more than 60%.